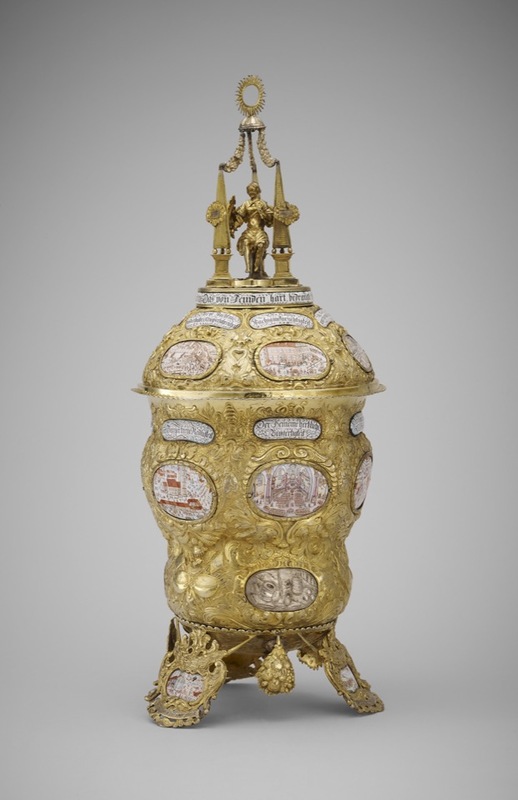 Made to commemorate the Siege of Freiberg, Saxony in 1643. Vase and cover; silver-gilt; embossed and chased; set with plates of painted enamel; domed cover surmounted by three obelisks with seated female figure in middle holding two crossed hammers and shield of arms painted in enamel, a gateway with towers, on the front of the shield, or a lion rampant (Frieberg? ); label on each obelisk; on sides of cover are six oval enamelled plates, painted in colours in miniature, with various incidents in the siege of Freiberg, over each is an explanatory sentiment on a separate plate; inside cover is convex medallion of white porcelain; body embossed with grotesque masks and military trophies; around upper part are six oval medallions enamelled with incidents of the siege and with labels like those on the cover; below, three plain silver plates with cannon etc; inscribed; three feet in form of frames with enamels emblematic of the divine protection afforded to the besieged; bunches of fruit between the feet; inscribed. H. Tait, 'The Waddesdon Bequest', BM London 1981, p. 86, fig. 62.